Beets are often overlooked by the beginning veggie grower, and that is too bad! Beets may be grown for both their greens and their roots, and either way they taste great!. They are heavy yielding, and high in iron and vitamins. Beets come in several colors and shapes. In addition to the standard dark red color, orange and white varieties are available. The lighter varieties do not bleed their color as readily, but are less attractive in canning jars and on the plate than the red ones. Round beets are most common, but flat and oblong types are grown as well. Flat and round beets tend to be early-maturing varieties, while the long cylindrical beets are usually late maturing. 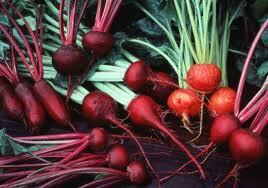 Beets are a cool season crop and grow well in the cool temperatures of spring and fall. They do poorly in hot weather. Temperatures of 60 to 65°F and bright sunny days are ideal for beet plant growth and development. They can withstand cold weather short of severe freezing, making them a good long-season crop. Size: The height of beet plants ranges from six to 12 inches and will spread from four to eight inches. Foliage: The foliage ranges from deep green to a lighter green depending upon the variety. Some leaves may have a small tint of red. Beet Root: There are no flowers or fruit on a beet plant. The edible root is below ground but may be visible on top of the soil. Beets flower and set seed in the second year, but that is only for commercial growers. You will pull and eat the whole crop in one year. How Many Beets to Plant? Five to ten feet of beets in a row will provide plenty of fresh beets for one person who really likes them. You can get about 10 to 30 pounds of beets from a 25 foot row, depending on the variety and on how long you leave them in the soil before harvest. If you are planting more for the greens, then you might want 10 to 20 feet per person who loves the greens.